The camera pans across a young girl, Jyoti Dhawan, who has spent three of her seven years of marriage locked away in a room;who subsisted on one roti and a mug of water every week; who was forced to beg at religious places; and pushed off a staircase when seven months pregnant. The camera moves in for a close-up of Jyoti‘s mother who hides her weeping face in her palms and looks away from the camera. Meanwhile, the camera zooms on to Nisha Sharma, the recent crusader who has been hogging the media limelight, looking sympathetically at Jyoti. Even as the lens captures Jyoti‘s crying visage, the most popular ‘bahu‘ of the Indian television screen lovingly holds Jyoti‘s chin in a spontaneous gesture. After ruling the television screen as Tulsi Virani in Balaji Telefilms‘ Kyunki Saas Bhi Bahu Thi for three years, Smriti Malhotra-Irani surfaces in a new avatar in SAB TV‘s new offering Kuch Diiil Se. The daily will air from 23 June, 2003, Mondays to Thursdays at 2:30 pm and 11 pm. An interesting move there, as the show can be sampled by women during the afternoons and working people during the night. And mind you, it is no mere coincidence that Irani is working in another show that starts with a ‘K‘. The show‘s producer, SAB TV‘s Charu Singh says the name was decided much before Smriti came into the picture. Irani says she is fulfilling her heartfelt desire of being either a Kiran Bedi or a Prannoy Roy on the small screen. "In my career, I have done thrillers, soaps, comedies and now reality television is the next frontier. It is time to ask all those questions we have always been scared to ask or seek answers for." When questioned whether she had done any social work in real life, she reveals after much prodding that she has been working for Helpage since the age of 11; has done work for Cancer associations; and NGOs who work with street kids. Then, she requests the writer to refrain from mentioning this in this report - but we are using our journalistic licence because it is relevant. In Kuch....Diiil Se, there are discussions on women‘s liberation; extra-marital affairs; the second wife; divorce; ghar jamai (the resident son-in-law), amongst others. The questions are very simple, yet complex: "Why should a ‘liberal-minded‘ woman be perceived as one with a loose character? "; "Can legally married couples that stay together enter extra-marital relationships as long as they are open about it? "; "What are the insecurities of a second wife whose legal status is null and void? "; "Do men use children‘s possession as an issue to scare women who are keen on divorce? "; "Why should there be so much anger and hurt when age-old traditions are broken? "; "Why should a doli (marriage procession of a bride) leave the girl‘s house - why can‘t the baraat (the groom‘s group) stay back in the girl‘s house?" The show has a high level of interactivity and preparations have been going on for the last two months. Ten topics were chosen and viewers were asked to respond through a multimedia communication campaign. The idea originated when the channel‘s hosts (Vir Sanghvi, Karan Thapar, Manoj Raghuvanshi) started getting calls and e-mails from people in distress. The channel‘s creative team realised that there was no forum which could address these queries. There was clearly a need for such a show and a gap in programming that could be explored. But, how can the ideal bahu who has inspired several ‘traditional‘ clones take on cudgels for the average Indian woman? Irani emphatically states: "Are you trying to tell me that ideal women don‘t react to wrong things, deeds or thoughts? 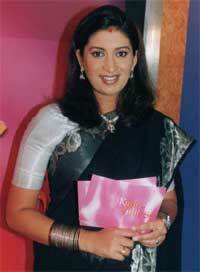 I shall be hosting the show as a woman - as Smriti Irani. Today‘s society has become so cynical - it is time to sensitise it." SAB TV producer Charu Singh adds: "When we conceptualised the show, Smriti‘s name topped the list of a dozen probables. She had the credibility to ensure that the show doesn‘t become too flippant. We strongly felt that afflicted people would open up and pour their heart out to her. Mind you, it is difficult for people to open up to strangers but Tulsi aka Smriti isn‘t a stranger - also, she has the sensibility to tackle people appropriately. When we spoke to her, she seemed excited and had the dates that she could give us. We haven‘t looked back since then and it was Smriti all the way." As far as the name Kuch... Diiil Se is concerned, Singh adds that she had coined a test title and the Adhikari brothers liked it so much that they decided to retain it. Irani goes on to add that her popular on-screen character only helps her to connect to people who are invited to the show as case studies. "People identify with my on screen persona and connect to me instantly. Even as Tulsi, I never tolerated any regressive norms or any form of injustice. I am proud to claim that only a bahu like me can host this show." Well, viewers of the popular soap Kyunki will vouch for it as ‘Tulsi‘ was seen urging her daughter to slap eve teasers in college. Irani also adds that Balaji‘s creative director Ektaa Kapoor has given her the freedom to voice her views if she feels that any element in the script of Kyunki is not in sync with her beliefs and values. Those who know her will vouch that Irani definitely has values and principles that guide her life. She proudly states: "I still prefer to wear either a saree or a salwar kameez despite being in the glamour industry. I have the power to make it clear to my male colleagues that I won‘t tolerate any nonsense from them. In one of the episodes of KDS, I met a woman who openly complained of sexual harassment only when the man tried to get physical. When I spoke to her, she revealed that he had been making advances for six years. Very bluntly, I told her that she was responsible for his overtures as she had encouraged him. No one can exploit anyone forcibly without the opposite person‘s encouragement or approval." A classic example of Irani the person coming to the fore is also seen in the episode on sexual harassment at work. In an effort to be just, Irani even rebukes women who use sexuality to become ‘hot favourites‘ with their bosses. She also chides the people who merely watched Jyoti Dhavan‘s husband dragging her by her hair through the lanes of a popular market in Delhi. However, she empathises with husbands who have been conned by wives who have misused the law (section 498 A) and wrongly accused their husbands of demanding dowry. Irani also says that she is learning a lot of things while hosting the show. "Being in touch with the research team, the case studies, the legal authorities, the NGOs and audiences has helped me get insights into different aspects of the problems," she adds. She also remembers an instance of a newly married man who openly admitted to having affairs even after marriage. "I walked to the man‘s mother-in-law and asked her for a reaction. She tried to evade it by saying that her son-in-law merely had some close girl friends. I asked her to look into his eyes. At that moment, the son-in-law walked up to her and said that he was committing adultery even after marrying her daughter," reminisces Irani. While talking about her conduct, Irani says: "As a host, I take care to ensure that I am not being too judgmental. There is this episode in which we tackle the issue of lesbianism. The case study on the show felt that I had become judgmental and I had no qualms about apologizing to her on screen and in public view." She however rues the fact that she has to be on her feet for hours during the shoot. When asked whether she is stepping into the shoes of the late actor Priya Tendulkar who had a show earlier on SAB TV, Irani says that she will find it difficult to fit into the ‘big big shoes‘ of Tendulkar who was a "strong and dynamic personality". When asked as to how the show could solve the problems of people, Irani says the show is merely a platform to voice opinions and concerns. "People who are in distress can write or call us. We can request an NGO to help them. We have eminent experts on our panel such as Dr Mohini Giri - a psychiatrist - and Meenakshi Lekhi - an advocate." Irani says that even if one person raises a voice against any form of injustice after watching the show, the purpose will be achieved. " We have lost faith in the government machinery and legal mechanism. People accuse us - in the world of media and glamour- of not giving back anything to society. Here I am, making an honest effort!" Irani has a one year contract with SAB. When asked about the most poignant moments during the shoot, Irani says: "I am not a typical woman who easily breaks down. But, I broke down when I first met Jyoti Dhavan face to face for initial discussions during the familiarization process. Later on, during the shoot, I found myself giving in to my emotions to such an extent that even the makers of the show were concerned. At that time, it didn‘t matter whether I was Smriti or Tulsi - any human being would have displayed similar reactions. I still can‘t bear to watch the episode. I just don‘t want to get over it." Although they seemed to be pretty tight-lipped about it, the fact remains that the SAB TV team has managed to give a job to Jyoti Dhavan as she didn‘t want to ever marry again. Watch her on 23 June 2003. The channel is also going all out to promote the programme that has the potential to shock as well as to hold attention. SABTNL president (sales and marketing) Kanta Advani says: "The programme is so hard hitting that we are not trying to commercialise it entirely. However, we are in talks with several advertisers who would seriously look at associating themselves with the programme. We are confident that the programme will definitely deliver audiences." Certain media observers say that the channel should have gone all out as the programme has the potential to become highly popular. They add that the communication and promotions have been pretty low key - as if the channel is depending on word of mouth. However, when queried about the low key hype around the programme, Advani counters, "We have already devised a multimedia promotional campaign. On Monday, 23 June, you will see 80 cc ads released in all the major newspapers such as The Times of India group, The Hindustan Times group, Amar Ujala, Dainik Bhaskar amongst others. We also had a major blitz two months prior wherein we promoted the programme on our channel and urged viewers to respond and present their case studies." The point is that SAB TV is doing some great things but viewers are oblivious. One hopes that the channel ups its ad spend and communication campaign so that more viewers across the country would start sampling the channel‘s fare.